Model of Mills Bomb [maker unknow, c1915-1918] Canadian Centre for the Great War. As you delve more deeply into the material objects of the Great War one of the more esoteric items you might find are china figurines, which were commercially manufactured by both sides during the conflict. While it might seem odd in our own modern context to have a china figure of a tank or a zeppelin on your mantelpiece, collecting figurines already had a long history in Europe, particularly within the middle class. Like many other manufacturing processes, the early part of the industrial revolution in the 1780s and 90s allowed the pottery industry to begin mass producing their products, with an assembly line of workers to finish and paint them. By the late nineteenth century, firms like Wedgewood in England and Meissen in Germany produced thousands of figurines that graced the living rooms of middle class families. The outbreak of the war provided an opportunity for these companies; since they were already marketing china the was trend driven, such as chinoiserie and coronation cups, it made sense to capitalise on the nationalist sentiments sweeping Germany, France and Britain by manufacturing china with a patriotic theme. The first year of the war saw thousands of designs with patriotic symbols; a German company named P.A. 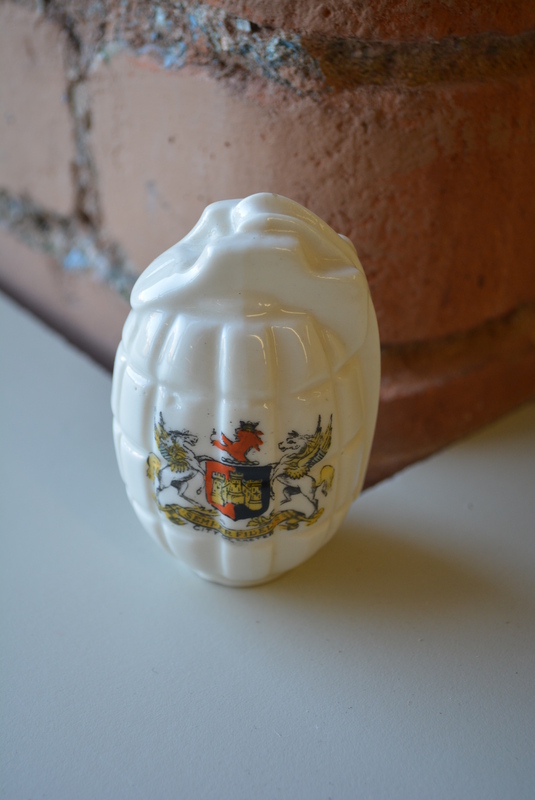 made a clayware stein celebrating the fall of the fortified city of Namur and British potteries produced thousands of figurines with the badges of the many local Pals battalions raised under Kitchener’s New Army scheme. Though Canada’s pottery industry was relatively small at the time, a scattering of cups, saucers and other small wares showing the Canadian Red Ensign flag and the three-stem maple leaf can still be found. By 1916, potteries had expanded their lines to include tanks to celebrate their first use at the battle of the Somme and even replica Mills Bombs; however there is a noticeable trailing off of figurine production after this point. Certainly, one can find the odd piece dated 1917, but the majority show a date of production between 1914 and 1916. Though I have not made a statistical analyses that would verify these surmises, it is my theory that this drop in the production of patriotic china reflects a general drop in the public sentiment surrounding the war. 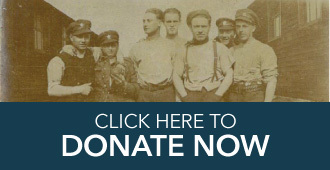 By 1917, Britain had gone through the Somme (over 60 000 casualties on the first day) and had seen the majority of its young people in uniform, many of them never to return. France was fighting an attritional war at the Chemin-des-dames with thousands lost each day, and Germany simply no longer had the available resources or manpower to produce such frivolous objects. Initially a conflict that was approached as a grand adventure or as a nationalist endeavour, the war had become a grind that would give victory to the army that endured the longest. The armistice in 1918 saw another spike in production of souvenir items, at least in Britain, Canada and the United States. Germany was in the throes of a revolution and certainly had no reason to celebrate the armistice and it would appear that France was most likely concerned with the vast amount of reclamation that had to go on after the war, but for the Allied countries whose own territory had not been devastated, the armistice was cause for celebration. Once again, Britain’s potteries capitalised on the collecting sentiment of its customers and made thousands of commemorative cups, and even a version of Sir Edwin Lutyen’s London cenotaph in 1919. Like many elements of pre-war life, china collecting slowly began to diminish and by the outbreak of the Second World War, the attitude to war had changed so much that it is likely that no manufacturer would consider producing collectibles to mark its beginning a viable business idea. In an interesting twist, 100 years later there are once again many china collectibles being sold to commemorate the beginning of the war.